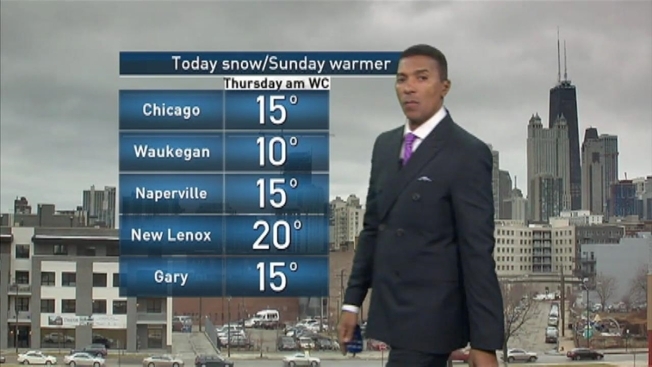 NBC 5's Byron Miranda gives us a look at the weather forecast. Just one day after severe storms and tornadoes tore through the Chicago area, a major temperature drop is set to bring snow to the area and possibly messy travel conditions for afternoon commuters. In far northern Illinois, a rain-snow mix was reported by the early afternoon hours. That wintry mix is set to move into the Chicago area as temperatures drop roughly 30 degrees from what they were 24 hours earlier. Light rain is expected to transition to light snow and flurries in the Chicago area, with the greatest chance for snow set to arrive during rush hour. While no significant accumulations are expected, the wet weather could make for difficult road conditions as temperatures plummet. The snow is expected tomove out of the area by the evening hours with another chance for scattered showers or flurries Thursday. Temperatures stay cool Thursday with highs expected to sit in the upper-30s, but they will slowly warm heading into the weekend with near-60 degree temps forecast for Sunday.